At the Atlantic Coast Retina Club/MACULA 2019 meeting, held January 10-12 in Boston, a number of presenters commented on how the passion of a particular generation of retina doctors (of which we are members) stemmed from a fascination with surgery. The pharmacologic options with which modern retina specialists are so familiar were but concepts when our generation entered the field. The tectonic shift initiated by the arrival of pharmacotherapies morphed our subspecialty from a surgical one to something of a surgical/medical hybrid. Which is not to say that the arrival of pharmacologic solutions has tainted our field. Quite the opposite. These feats of biomedical engineering that have fundamentally altered the way doctors understand blinding diseases have restored sight to tens of thousands of patients. This is nothing short of miraculous. Still, we believe we ought to pause to consider how surgery—the foundation upon which this field was built—has evolved in the past few years. Surgery plays to our core fascinations. Surgeries are physical puzzles of tissue that require complex spatial reasoning. The engineer inside each surgeon understands the elegance of individual surgical tools, and feels a jolt of awakened awe when they look into a surgical microscope—or, as the modern age would have it, places a pair of 3D glasses on their face and sits upright. 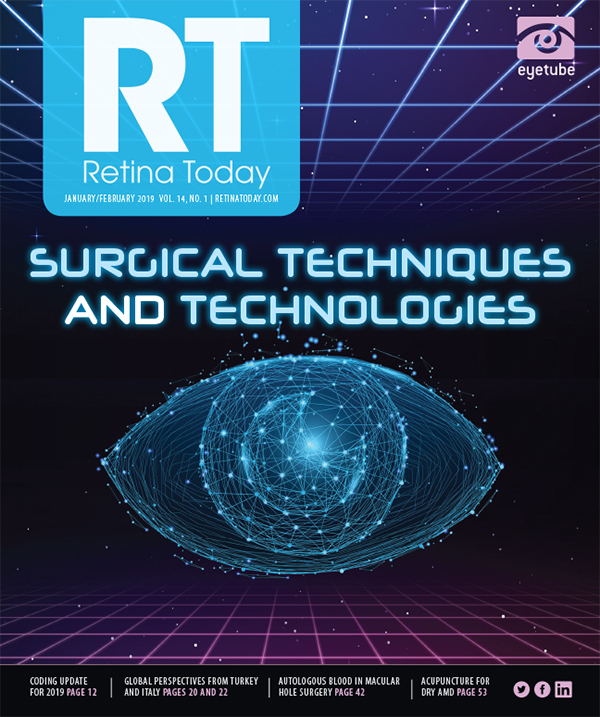 The surgical innovations that have come to fruition in the past year are too numerous to exhaustively catalogue in this issue of Retina Today. We believe, however, that the articles in this issue’s cover focus address some of the largest trends (and smallest instruments) in the field. S.K. Steven Houston III, MD, details how a heads-up 3D viewing platform has changed his approach to some of the most fundamental procedures in the OR: membrane peeling and tractional retinal detachment repair. This new platform, Dr. Houston argues, encourages surgeons to perfect their skills, micron by micron. New technologies have also allowed Alan J. Franklin, MD, PhD, to improve his surgeries, particularly in patients with diabetes. Dr. Franklin’s article reviews how a new pair of forceps, an improved instrument design, and a novel visualization platform work in concert to refine his skill set. A discussion by María H. Berrocal, MD, and Luis Acaba, BA, on one particular technique—the use of internal limiting membrane flaps and autologous blood in macular hole repair—demonstrates a recent reality: the marriage of older theoretical concepts and modern surgical tools may result in improved anatomic and visual outcomes. No compendium on techniques and technologies would be complete without including a submission from Eyetube, the go-to digital video database of surgical procedures (and Retina Today’s sister site).Eyetube’s Retina Chief, Michael A. Klufas, MD, highlights a pair of surgical cases, one of which is viewed best on the Eyetube 3D Channel. If you haven’t yet checked out Eyetube 3D, grab your nearest pair of VR goggles (hopefully they’re the ones handed out at a Retina Today booth during 2018), open the Eyetube app on your smartphone, and strap in for a ride. The final article in this issue’s cover focus assesses recent innovations from a structural standpoint. Peter A. Karth, MD, MBA, posits that the postoperative regimens commonly prescribed by surgeons reflect concerns from a bygone era. The innovations that have defined retina—particularly 27-gauge surgery—provide unrealized benefits to patients whose surgeons continue to advise old-school positioning in the postoperative period. A less demanding postoperative regimen could improve quality of life and reduce treatment burden, Dr. Karth submits, and it is time to return to evidence-based medicine when considering the instructions we give patients. Dr. Karth’s article is a reminder that surgery does not exist for surgery’s sake. At the center of each surgery is a patient, and on the other side of the surgical center’s doors are caregivers who help manage patients’ lives. Although we ought to be free to celebrate surgical innovations when they appeal to our sense of scientific curiosity, we must also remember that these innovations are not designed to make our surgeries more fun, but rather, to optimize patient outcomes.